In terms of design, there really isn't much to say about the disc-less Xbox One S. The device is completely identical to its normal counterpart, but -- as you might expect -- the disc tray is missing. 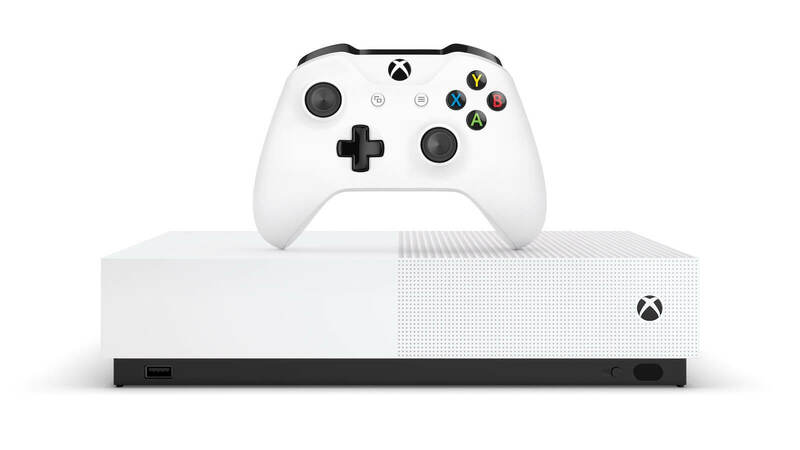 The design isn't the main attraction for the new Xbox One S, though; that honor goes to its price tag, which is now $250 versus the standard Xbox One S' $300 cost. That's a pretty deep discount, and Microsoft is even throwing three free digital games into the mix: Minecraft, Forza Horizon 3, and Sea of Thieves. Furthermore, you'll get a free month of Xbox Live Gold (which gives you multiplayer access, among other goodies) and a "special offer" for Microsoft's Xbox Game Pass service, which has been called the "Netflix of games" in the past. Unfortunately for those individuals, the wind probably won't be blowing in their favor for much longer. A digital-focused, always-online console (the new Xbox One S is not the latter, to be clear) is something Microsoft has been hoping to launch for years now. However, it has always been a matter of timing: the original Xbox One was going to be an always-connected, anti-used game device at first, but Microsoft misjudged how the public would react to the idea - it was too soon, and pressure from the public forced the company to change things up. Now, though, the gaming landscape has changed. We are living in the age of "live services," and plenty of AAA games require constant internet connections right out of the gate. As a result, gamers are starting to become desensitized to the idea, for better or worse. The end goal for Microsoft will likely be to convince as many gamers as possible to sign up for the upcoming "Project xCloud" game streaming service - but only time will tell. If the new disc-free Xbox One S sounds like your cup of tea, you can pre-order via Microsoft's official website. The first consoles are expected to ship out on May 8. Eh, I guess it's a nice option to have, but I'll be sticking with more game market choice (disc) for as long as I can. Especially when you can get the ones with disk drives for less money anyway. A sop to their retail partners, perhaps? The ones with a drive have been available for $250 for months, even if the "official" price for them is $300. Might as well get one of those and have a free drive for Blu Ray, etc. Dimitrios and lumbeeman like this. Pass. Rather have the Bluray drive so that I can use whenever I please. I would buy this instantly if there was a disc-less resale market. I'm sure it would be easy to implement a system whereby people sell their licence to play a game, and the recipient gets a digital copy of it. Microsoft could take a cut, and everyone's happy. As it is, with new games costing like £60 from digital storefronts, and sales being quite rare, I'll stick with Steam! Dimitrios, ShagnWagn, Arris and 1 other person like this. Isn't the 4k blu ray player one of the main selling points of the Xbox One S? Why would you get rid of that to save $50? This seems like a really bad deal. Why would anyone ever do this? Who, in any industry, allows licensing to be forwarded to another individual after claimed? Why should we ever be allowed to do it? Software is not a physical asset. For instance, a tool is made with materials and labor and you directly compensate that company for materials and labor. You fully own it, so you can sell it. But software licensing, you agree to pay a fraction of the labor costs with the understanding you don't own the product. Why would a consumer have the right to resell a product they didn't pay for in full?